The Robot Arm Calculator is designed to help you determine the lifting capability of your robot arm. For example, can a robot arm of X length, with your motor, lift Y weight? It is a supplement to the robot arm tutorial. If you do not understand how to use this calculator, please read the tutorial first. Note that all entered values will be saved as a cookie on your computer (if you have cookies enabled) so you don't need to reenter anything on future visits. Note that you can also try out the excel version of the robot arm calculator. It includes an additional robot arm kinematics visualizer. Enter in values for your robot arm. Between each motor joint is an arm linkage L. Enter the length of each linkage. If a linkage does not exist in your design, set L to zero. Now enter the weight of each arm linkage. The center of mass is assumed to be 1/2 of L. If a linkage does not exist, set the weight to zero. Enter in the weight of each motor. 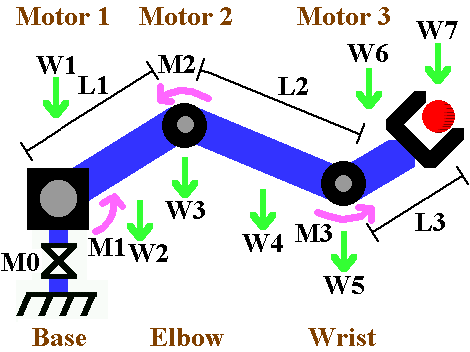 Motor 1 is the base motor, Motor 2 is the middle joint, and Motor 3 is the wrist motor. note: For some reason the result when adding in acceleration looks astronomically high, but I can't figure out for the life of me where my equation mistake is. Just leave these at 0 if you don't trust the result. Sorry! Look at my source if you think you can figure it out . . .
For each joint to rotate at a specific acceleration, you need to add additional torque to what you need just for static lifting. Fill in the acceleration you want for each joint. Motors and gearing are never 100% efficient. Enter expected efficiency. If you are unsure about efficiency, check out my gearing efficiency tutorial. These are the finished results. This is the maximum torque that each motor requires to lift both the arm and the given object weight at full extension at required velocity. Shorter arms and lower weights reduce required torque. Useful information to help you with other parts of your robot design. For the encoder calculation, this will tell you the expected typical positioning error due to the base motor encoder. If you are using a servo for the base motor, enter 360. Shorter arms and higher resolutions decrease error.